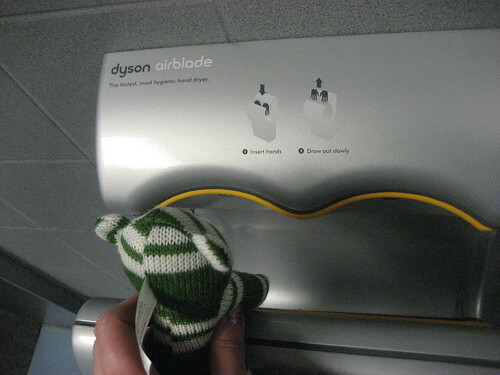 The sock monkey found his arms were too short for this modern hand drying device. On this date in 2009: Monday, Monday, in which I didn’t like that day. 2008: New Toy, in which Mr. Karen made me a swift. 2007: Possibilities, in which I opened my fabric sketchbook. 2006: A Body in Motion, in which I ran for 25 minutes in a row. 2005: Winter Count—November, in which I looked back at becoming a knitter again. 2004: The Quilt That Isn’t, in which I described a project that never came to be.